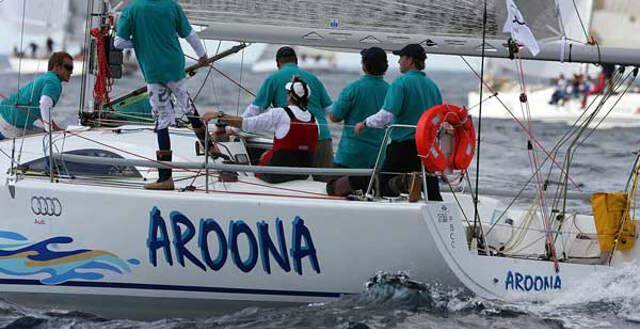 The arrival of Tony Purkiss and his five Newcastle and Lake Macquarie mates on the Swanson 36 Mister Christian has signalled the end of the 25th Audi Sydney Gold Coast Yacht Race. The five-boat Sydney 38 fleet contesting the 25th Audi Sydney Gold Coast Yacht Race enjoyed a “gigantic match race” up the New South Wales and south east Queensland coastline according to the co-owner of the eventual winner, JSteel. Nick Athineos and Rick Christian’s modified Steinmann 66, The Stick, formerly a two-time round the world Open 60, has surfed into first place in the PHS division of the Audi Sydney Gold Coast Yacht Race. The last boat in the Audi Sydney Gold Coast Yacht Race fleet, Mister Christian, entered the silver jubilee Audi Sydney Gold Coast to “have a bit of fun”. This afternoon skipper Tony Purkiss admits the laughs are wearing a little thin given the 28 year old Swanson 36 is practically stopped dead in the water, doing just 1.6 knots in the glassy conditions south east of Coffs Harbour. Stephen Ainsworth's Reichel Pugh 63 Loki which was launched just prior to the 2008 Rolex Sydney Hobart has fired the first shot in the season’s opening event, the Audi Sydney Gold Coast Yacht Race which will wrap up at Southport tomorrow, taking out the coveted IRC overall win. 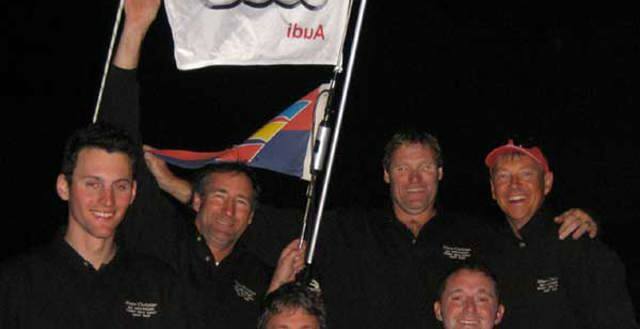 Prior to Tim Wiseman’s accident during the 25th Audi Sydney Gold Coast Yacht Race a homing pigeon blown out to sea in the fresh westerly breeze, had been following the 100 footer and according to reports from the crew, had made several attempts to land on the boat. At this point Stephen Ainsworth’s Sydney based RP63 Loki looks to have the IRC overall silverware in the bag, a result which will be confirmed in the coming hours as more in the fleet cross the finish line off Southport’s Main Beach. This evening at 7.25pm, Bob Oatley’s supermaxi Wild Oats XI took line honours in the Audi Sydney Gold Coast Yacht Race, the boat’s first attempt at the 384 nautical mile race coastal race which is celebrating its silver jubilee. Yendys’ navigator Will Oxley, one of Australia’s best, recently reported, “We are in difficult conditions, the transition period I mentioned pre-race is alive and well”. Oxley also took time to congratulate Loki on their efforts so far which have them fourth in the fleet and still leading on IRC handicap, as they have for all of today. The elusive Audi Sydney Gold Coast Yacht Race record will remain in place for another year with the current race leader, Bob Oatley’s Wild Oats XI, still with 37 nautical miles to chew through. They are due to finish after 6pm this evening, more than an hour and a half outside the record time of 27 hours 35 minutes 43 seconds set 11 years ago. Wild Oats XI’s bowman Tim Wiseman is this morning at Royal North Shore Hospital in Sydney awaiting surgery on his index finger which was injured yesterday afternoon four hours after the start of the 25th Audi Sydney Gold Coast Yacht Race. Queensland boat Black Jack, skippered by Mark Bradford, has overnight managed to hold back the rest of the 25th anniversary Audi Sydney Gold Coast Race fleet but will have to face relinquishing their lead given the insurmountable waterline length advantage of Bob Oatley’s Wild Oats XI. Peter Harburg’s Queensland based RP66 Black Jack is this evening’s Audi Sydney Gold Coast Race leader. According to navigator Ed Smyth they were blasting along in 25-28 knots of breeze at 9pm this evening and pointing towards home on record pace. Just hours into the 25th Audi Sydney Gold Coast Yacht Race the situation at the front of the fleet changed dramatically when Wild Oats XI’s bowman Tim Wiseman got his hand caught in the mainsheet block. Round one of the silver jubilee Audi Sydney Gold Coast Yacht Race went to the Victorians, the wily interstaters brazenly beating the Sydney bunch out of the starting blocks on Sydney Harbour today. While the best pressure in this year’s 384 nautical mile race will come once the leading crews are ensconced at Southport Yacht Club, supermaxis such as Wild Oats XI only need to average 14.6 knots to claim one of the mighty Brindabella’s remaining race records – and they can reach at speeds of 15 knots in just 5 knots of pressure. For Wild Oats XI, Bob Oatley’s 100ft super maxi, the clear line honours favourite, these weather conditions are perfect for them to break the 11 year old race record of 27hrs, 35 mins and 43 seconds set by Brindabella in 1999. With entries having closed at 1700hrs this afternoon, a bumper fleet of 78 has entered the 25th Audi Sydney Gold Coast Yacht Race. With one week until entries close for the 25th Audi Sydney Gold Coast Yacht Race, this year’s race is shaping up to be a record breaker in more ways than one. With just over two weeks until entries close for the 25th Audi Sydney Gold Coast Yacht Race, interest in the potential Veterans division of this year’s race is taking shape with three IRC boats registering their intent; Love and War, Simon Kurts’ Sparkman and Stephens 47, Spirit of Koomooloo, Mike Freebairn’s S & S 49 and Wild Rose, Roger Hickman’s Farr 43. 53 entries have been received to date for the 25th Audi Sydney Gold Coast Yacht Race, with the fleet anticipated to reach records heights of 85 plus boats, one of the biggest fleets since 1997. The 25th Audi Sydney Gold Coast Yacht Race is shaping up as a battle of the Beneteau First 40s. Last year’s Rolex Sydney Hobart overall winner Andrew Saies’ Two True will make the long trek to the start line from his home town of Adelaide, where he will be met by two other recently launched Beneteau F40s Flying Cloud (CYCA Vice Commodore Howard Piggott) and Close Halled (Graeme Hall). Super maxis Wild Oats XI (Robert Oatley) and Investec LOYAL (Sean Langman and Anthony Bell) have signalled their intentions to head north in the 25th Audi Sydney Gold Coast Yacht Race with the 11 year old race record of 27 hours, 35 minutes and three seconds, held by Brindabella, to be seriously challenged. 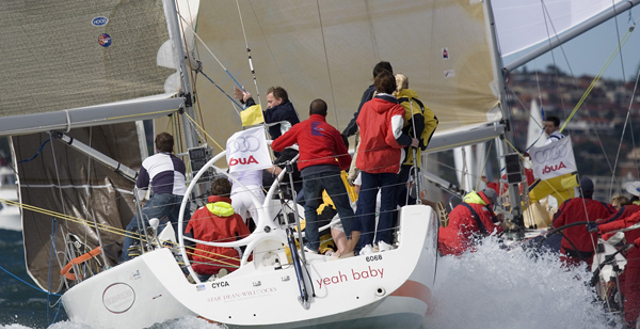 The opening two events of the 2010 Audi IRC Australian Championship race have proven that you don’t need to be a super maxi to be a serious contender for the national Championship title which is endorsed by Yachting Australia.